Nineteenth-century Victorians adored it. Twentieth-century tastes found it vulgar and banished it from their homes. Today, as we begin to appreciate the ingenuity and craftsmanship of Queen Victoria’s age, the brilliantly colored ceramic ware known as majolica once more is attracting enthusiastic collectors. Earthenware shapes, usually incorporating figural designs of flora or fauna, then decorated with colorful opaque glazes were first popular during the Renaissance in Italy and France, where Bernard Palissy reigned as master potter. The Victorians, with more modern technology, developed a broader palette of jewel tones to please their contemporaries. Emerald green, turquoise, sapphire, blue, pink and yellow all figure prominently in 19th century majolica. Victorian majolica consists of earthenware, usually modeled with fruit, flowers or figures as an integral part. The piece was fired, then glazed with an opaque glaze containing tin or lead. When this glaze dried, bright glazes were applied to the design and the piece was fired. The result was a product unique to the 19th century. The majolica craze began in 1951 when Herbert Minton exhibited vases at the Crystal Palace, site of the Great Exhibition of 1851, noting that they were “colored after the style of the old Majolica”. Minton’s painstakingly sculpted and brilliantly glazed majolica pieces raged in size from dinnerware to large, elaborate garden fountains and contained three dimensional figures of feathered and furred animals, fish, shells and seaweed, as well as Renaissance- inspired festoons of fruit and flowers. Leaf shapes were popular for plates, shells for oyster plates and bees for honey pots. Minton’s success spawned competition. George Jones and Joseph Holdcroft, both of whom originally worked for Minton, established successful factories of their own. Jones’ pottery in particular became popular worldwide. His imaginative modeling and crisp colorful glazes insured his success from the factory’s beginning in 1861. Today, a signed piece from George Jones carries a premium. Wedgwood, a giant in the ceramic world, did not begin producing majolica until 1860, nearly 10 years after Minton. Their pieces, nearly always marked, rank with Minton and Jones in desirability. Other well-known British potters once producing majolica included S. Fielding & Co., Brownhill’s Pottery Co., W.T. Copeland & Sons, and John Adams & Co.
America’s Centennial Exposition in Philadelphia in 1976 provided the impetus for collecting majolica. By far the best know of the American manufacturers is Griffen, Smith, and Hill, whose Etruscan majolica designs depict plant and marine life. Their Shell and Seaweed pattern, modeled after a Wedgwood design, is delicately molded and glazed in opalescent shades of pink, grey, and blue, with green seaweed accents. Dinner services, bowls, humidors, and even cuspidors were available, but relatively few have survived. Because of its fragility, it is rare to find undamaged examples of Griffen, Smith, and Hill’s marine majolica, making it even more desirable. The majolica craze in America lasted a relatively short time, from the Centennial in 1876 until around 1900, and there were fewer well know potteries. George Morley & Co., a firm lasting only from 1884 to 1891, produced gurgling- fish and owl pitchers, usually unmarked. The Chesapeake Pottery in Baltimore, MD made Clifton, a pattern featuring blackberries and later other types of fruit and flowers. This company also made Avalon Faience, a more delicate design imitating French faience. Most pieces are well marked and many can be found in antique stores today. French potters of this period produced remarkably delicate and well made majolica. Some is well marked; others can be identified as French by the colors. Interiors of French majolica of the period tend to be teal blue, deep red or occasionally brown. Sarreguemines, Luneville, and St. Clement, well established factories, developed fine majolica rivaling Minton and Wedgwood. Emile Galle, renowned for his innovative carved cameo glass, worked for a time with St. Clement to produce majolica. 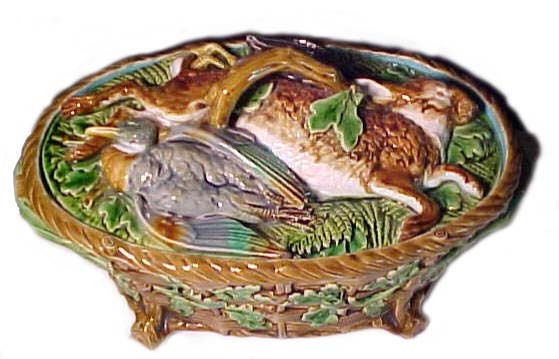 Many other continental factories (such as Germany’s Villeroy and Boch) made majolica in its heyday. All is sought by collectors, although pieces signed Minton, Wedgwood, George Jones and Etrusca are most highly valued. 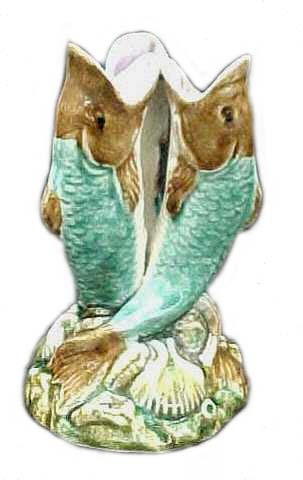 Collecting Victorian majolica is fascinating. A single piece can highlight a corner; a large collection can be a spectacular display in a cabinet or on shelves. You can assemble a group by background color, or buy only oyster plates, figural pitchers or humidors. If your budget is unlimited, you can specialize in signed George Jones pieces; if it’s tiny, you might start with an unmarked piece you like with a chip that could be turned to a wall. Be aware that there are lots of 20th century copies of Victorian majolica. * Most are lighter and less skillfully colored than the originals and the price may be a giveaway. If in doubt, buy only from reputable dealers. 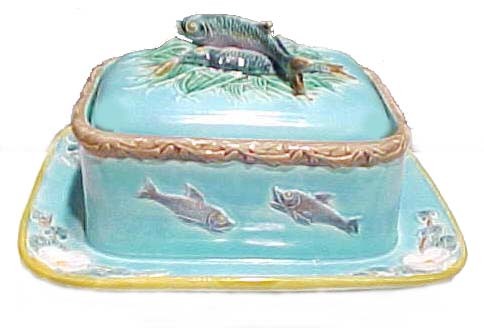 *You can find new, lesser quality majolica even sold in the Tiffany & Co. stores!